My husband and I recently moved to Bethlehem from the middle of nowhere Texas. Thank goodness (although we did meet some of our favorite people there)! I am sorry for any Texas readers out there, but as native Californians, life in Texas was very different for us, so we are happy for our new experience on the east coast. During our short time in the Texas panhandle, my husband and I discovered one of the best donut shops! The only problem was (and this was very common in the town we lived in), the hours were always unpredictable. On occasion that the shop was open, we loved to indulge in their glazed blueberry spuddies. 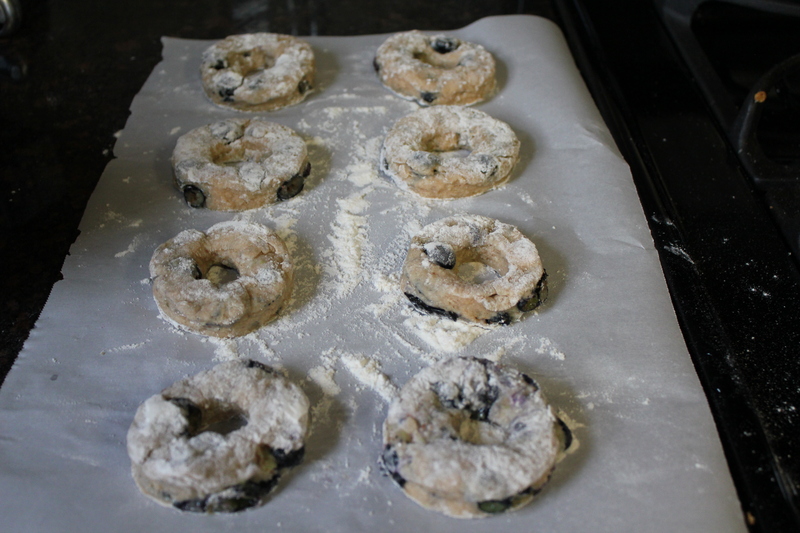 These miniature donuts, made with potato flour and fresh blueberries, were fried to perfection. Upon the first bite, they oozed a little bit of the absorbed fry…stop, I know what you are thinking (gross! )…but no, they were so melt-in-your-mouth delectable! Lately, I have been craving these decadent donuts, and since I never plan to return to our little town in Texas (am I too blunt? ), I decided to put my own hands to work. 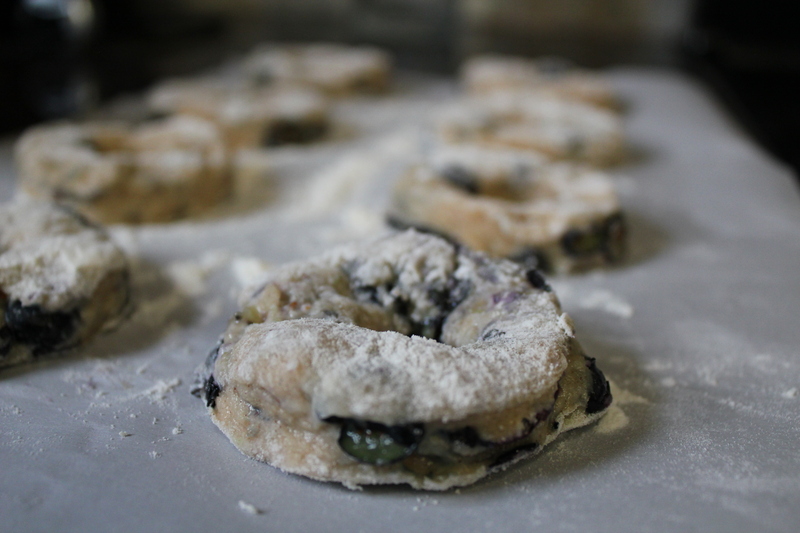 Although I think it would be fun to experiment with potato flour for the donut base, I think I will stick with all purpose flour, since it is much more commonplace in my home (and probably yours, too). 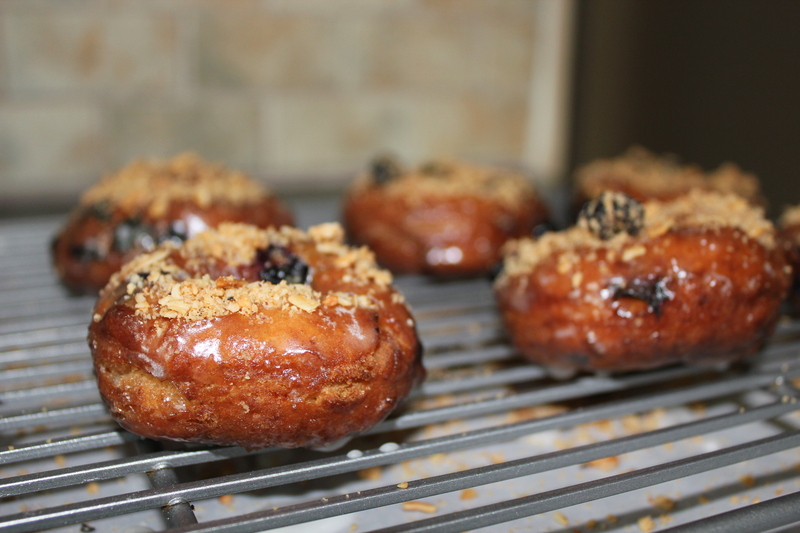 Because I can put my own spin on this recipe, I have aspired to make glazed blueberry cake donuts sprinkled with Granola Factory’s Native Berry Variety. I want to start by preparing our toppings: the glaze and the granola. Food process granola until it is in smaller bits and pieces. Set aside in a bowl. 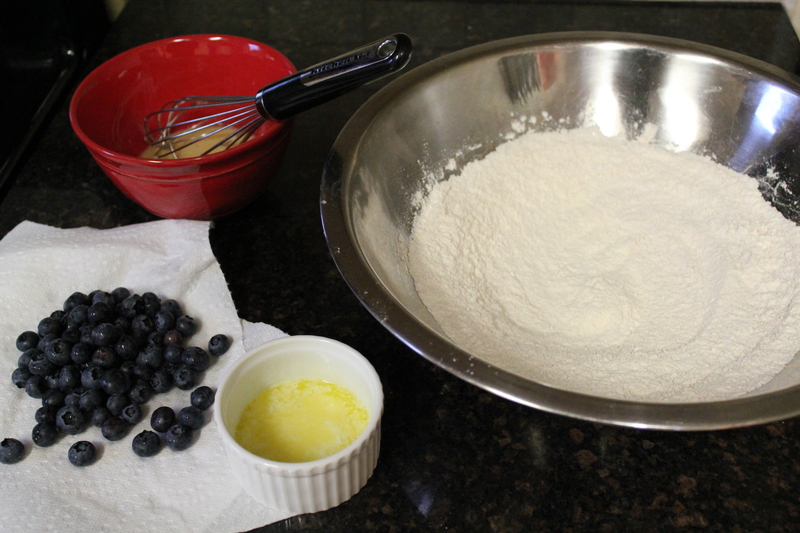 For the glaze, simply add powdered sugar, water, and vanilla extract to a mixing bowl. Stir until you have a thick, runny liquid. I wanted to start prepping here, because it is important to quickly dip each donut into the toppings after it has been fried. I get so anxious when I forget to put together a part of a time sensitive recipe, so I am hoping this initial step eliminates any potential stress! 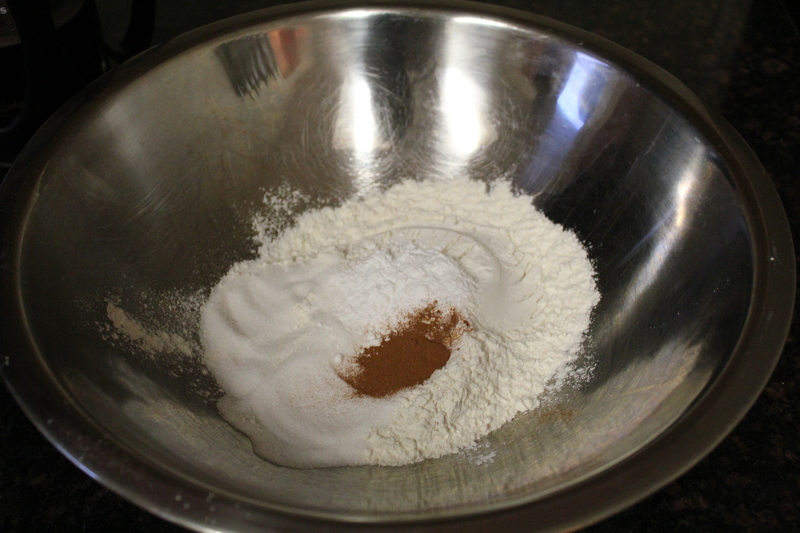 Now, let’s mix our dry ingredients in a bowl: flour, sugar, baking powder, and cinnamon. 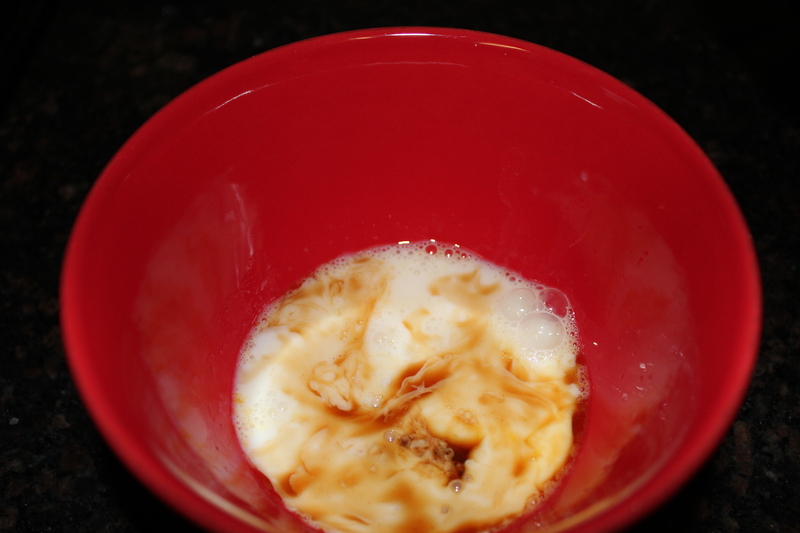 Follow suit with the wet ingredients: mix milk, egg, and vanilla extract. Pour melted butter into the dry mixture and stir until clumps appear in the ingredients. 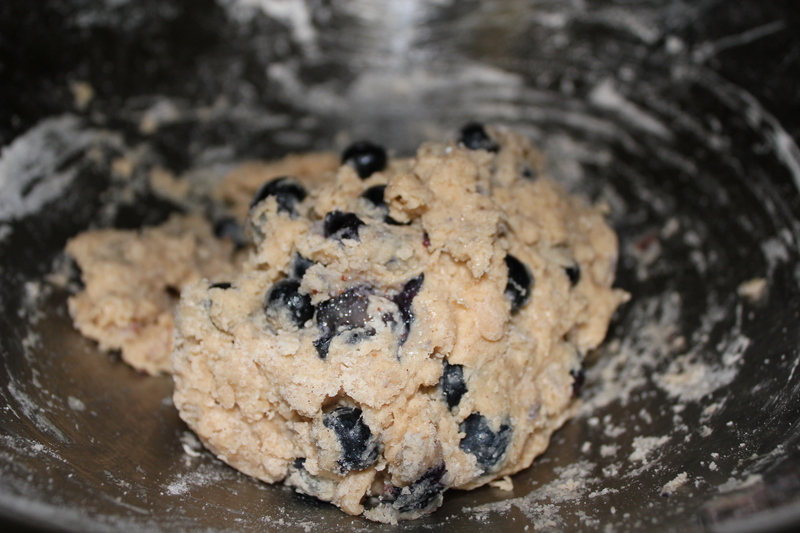 Now, add your wet mixture and blueberries. 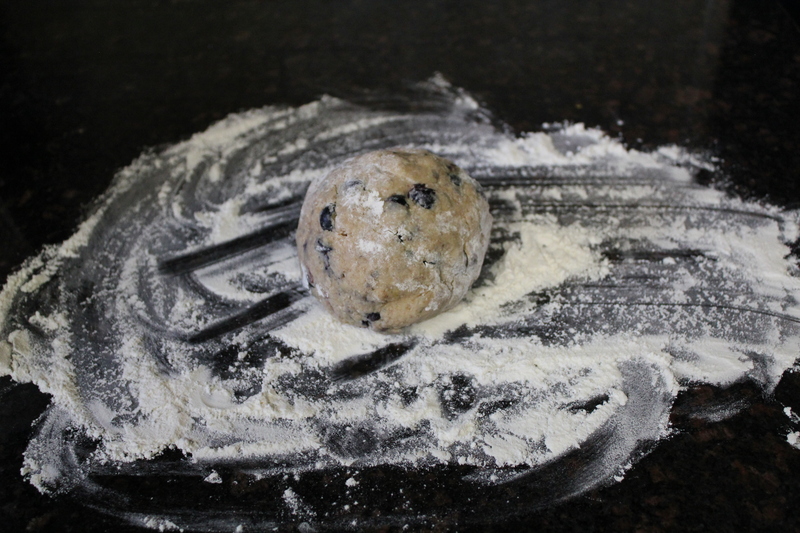 Combine with your hands and bring the dough together in a ball. At this point, I would start heating up your oil in a deep set pot, so that by the time you have your donuts shaped, you are ready to start frying. Heat on medium until temperature reaches 375ºF. 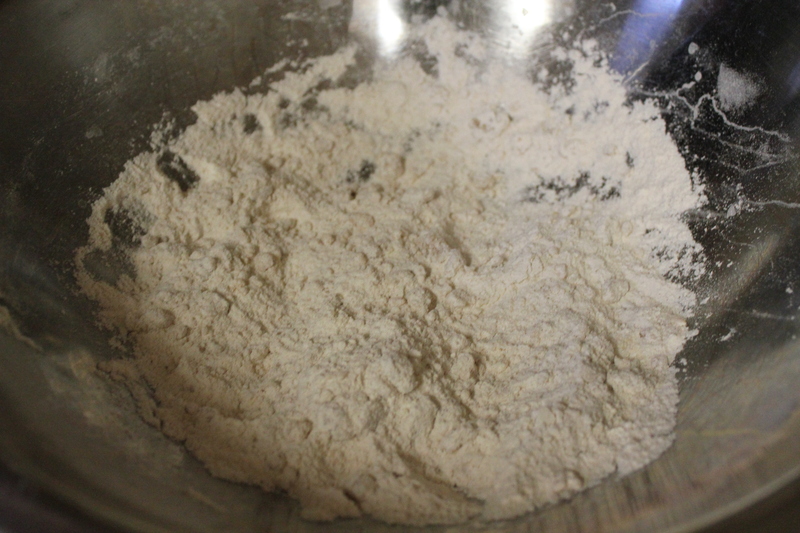 While oil is heating, flour a clean surface, and roll out dough until about a 1/2 inch thick. Use a round cookie cutter (about 3 inches in diameter) to cut out donuts. If you do not have a cookie cutter, use the top of a drinking glass for a sufficient shape. For the hole of the donut, I used the top of a plastic bottle of water. Set cut out donuts on floured parchment paper. Continue reworking dough (rolling into a ball and rolling out again) and cutting out your donuts until you have used all of the dough up. 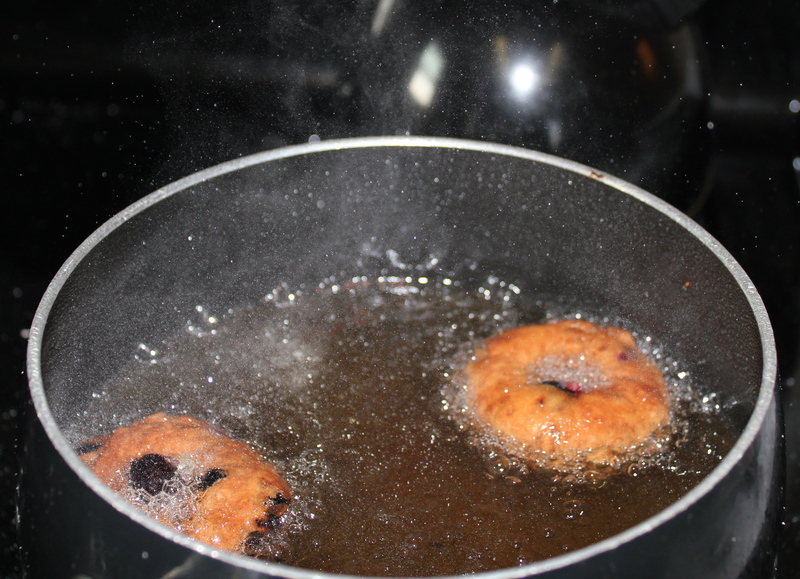 When oil reaches 375ºF, gently place one or two donuts at a time into the pot. Fry both sides for 45 seconds each or until golden brown. 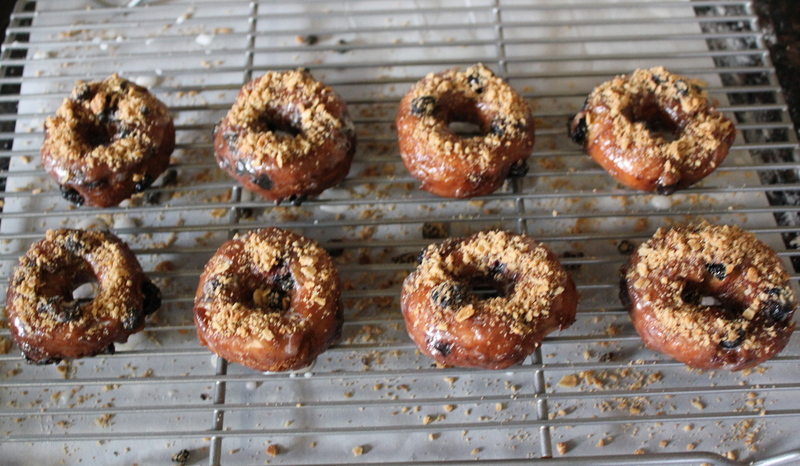 As previously mentioned, immediately dip both sides of the donut into the glaze, and set on a cooling rack. Then, quickly take a small handful (probably 1-2 tablespoons) of native berry granola bits and sprinkle on top of the donut. Let cool for a couple minutes…or not! Dive in and enjoy! Wow! I am impressed! These donuts turned out so well. The slightly dense element of the cake dough coupled perfectly with the crispy exterior. But, I think my favorite part of this donut was the sugar and spice: the sweet glaze blending with the powerhouse flavors of vanilla and spice from the the native berry granola. Yum! The best part? No more unpredictable donut shop hours. 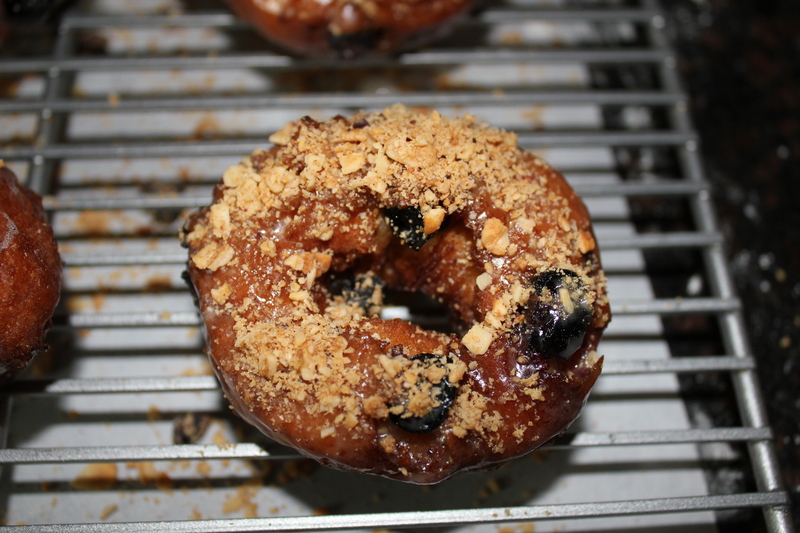 These glazed, blueberry granola donuts are reliable, soooo pretty, and undoubtedly delicious! Those donuts look delicious!! They remind me of the yummy donuts at Fractured Prune down at the MD/DE beaches. Thank you Sarah! 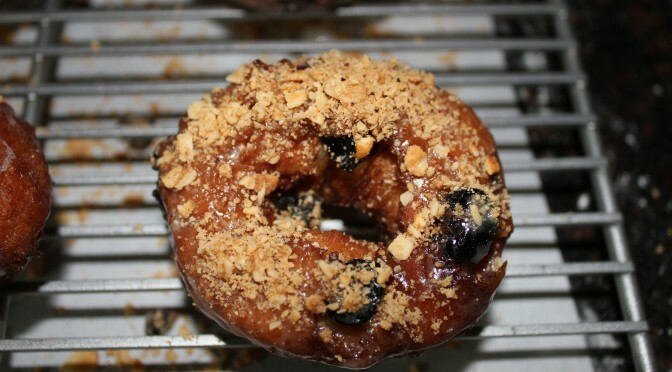 Never been to the Fractured Prune, but may need to check that out!